1. We will credit one bonus (the "Bonus") to the account if the account receives a minimum of one direct deposit in the amount of at least $100 within 90 days of account opening. This offer is valid on new accounts opened before 12/31/2015. Qualifying direct deposits include, but are not limited to, electronic deposits such as payroll or Social Security and do not include electronic money transfers or credits such as account-to-account transfers or those made through internet payment services. Bonus will be credited to the account within 90 days of direct deposit activation as long as the account is in good standing. Bonus is reportable for tax purposes. Only one bonus will be rewarded regardless of the number of accounts, titling on account and the number of direct deposit arrangements established. 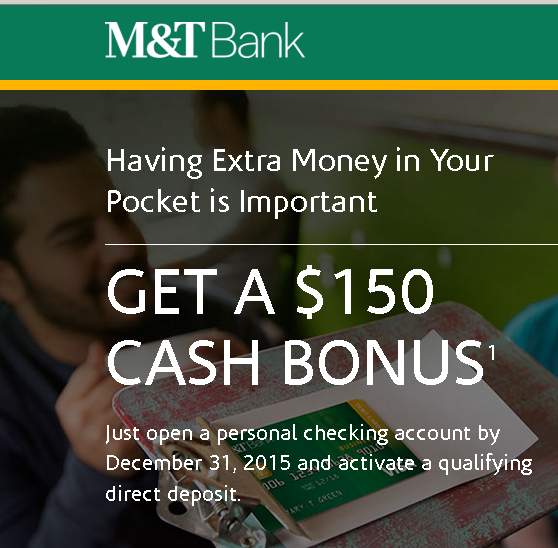 Bonus offer is not available for Health Savings Accounts, may vary by product and region, is limited to one per customer, and is not available to employees of M&T Bank or any of its affiliates. 2. A $9.95 monthly maintenance charge will apply unless at least one deposit or withdrawal is made during a monthly service charge cycle. Regardless of whether a monthly maintenance charge applies, M&T checking accounts are subject to transaction and service fees, including insufficient funds and overdraft fees. Got the bonus from M&T Bank.